Schindler’s List (1993): Dir. Steven Spielberg. Written by: Steven Zaillian. 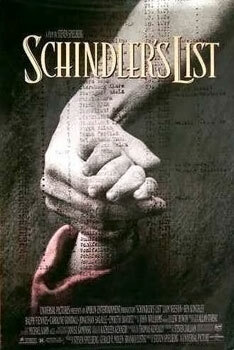 Based upon the novel Schindler’s Ark by Thomas Keneally. Starring: Liam Neeson, Ralph Fiennes, Ben Kingsley, Caroline Goodall, and Embeth Davidtz. Rated R for language, some sexuality, and actuality violence. Running time: 195 minutes. Known at the time for big-budget blockbusters, Steven Spielberg surprised many by taking on more serious subject matter with Schindler’s List. Audiences had never seen the Holocaust put to film so vividly before, and the film’s immense success was a foregone conclusion before it even opened. The film follows the profiteering career of one Oskar Schindler, a member of the Nazi party who exploited free labor from Jews during World War II. Struck by a bout of conscience, however, he begins paying off SS officers (specifically the villainous Commandant Amon Goeth) to save people from the death camps. Spielberg’s film does nothing to spare us from the terror of the Holocaust, and he deftly handles choreography and crowd control. The best scenes immerse us in the chaos and confusion of the Krakow ghetto, juxtaposed with the rigid, callous purpose of the SS. These scenes prove instrumental in making us understand Schindler’s change of heart, and the black-and-white aesthetic lends the story a sense of timelessness. Watching it for a second time has slightly quelled some of my reservations, but more than a few scenes stick out as pure contrivance. When Amon Goeth attempts to execute a factory worker, his gun jams. He replaces it, but that one jams too. Scenes like these seem like an attempt to bestow mercy on the audience, but they remove us from the historical realism Spielberg hopes to achieve. Luckily, a uniformly excellent cast brings us back even when the film goes astray. Liam Neeson has just the right amount of charm and bluster, while Ralph Fiennes proves an extraordinary foil: an insecure child in a military uniform. I ultimately come down positive on Spielberg’s film, but I wish he hadn’t tried so hard to portray the atrocities—as Roman Polanski showed in The Pianist, the horror of the Holocaust can speak for itself. Still, one cannot deny that the film successfully handles many moving pieces, and achieves a noble, moving purpose.